Most of the DVR systems on the market are little more than a "Digital VCR", meaning that when you got to playback the video, you have to sit there for hours fast forwarding through video that you don't want to see to find a single event. Our AVM (Advanced Video Management) system is the solution to this problem! Visually scan through days of video in 15 seconds or less. 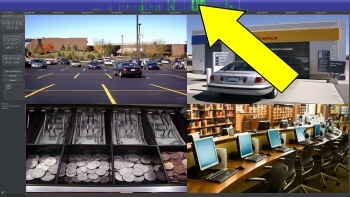 With this level of access to your footage, you can really use the video footage you recorded. 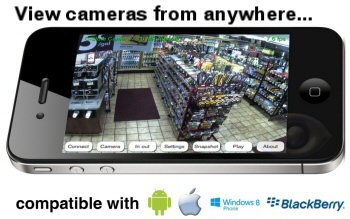 This system provides MUCH BETTER access to your footage than other systems on the market, allowing you to get the most out of your security cameras. 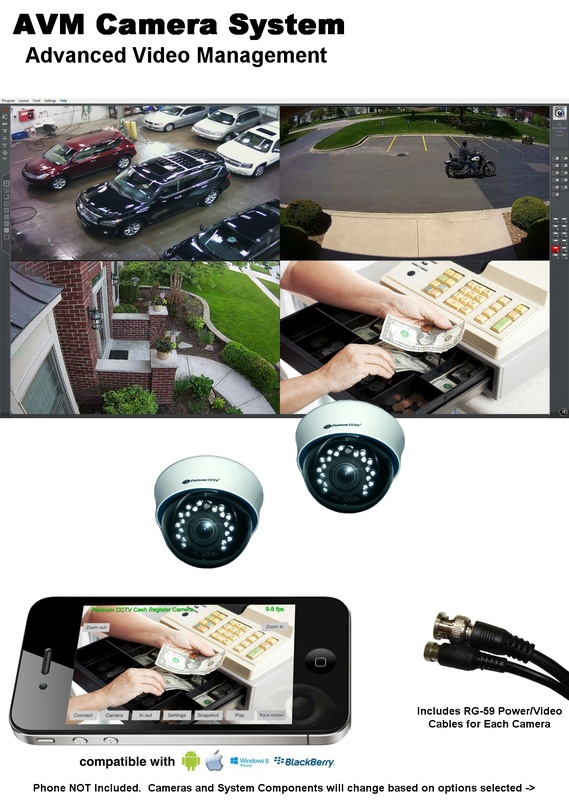 With our AVM Systems, we have been watching security camera footage remotely for over 12 years, and evolved our technology too. That means the system you purchase today is more highly evolved than the competition who have just begun to allow remote access. Our AVM systems provide enterprise-grade remote access capabilities from iPhone, iPad, Android, BlackBerry, Windows Phones, PCs and Mac. User accounts can allow or deny access to any of the features of the system, specific cameras, or even certain timeframes so that you can control who accesses your system. 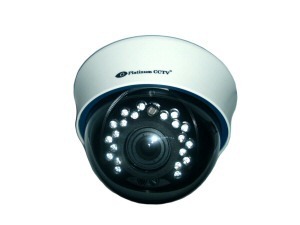 Employ the level of security trusted by banks, airports and government facilities in your own home or business.. 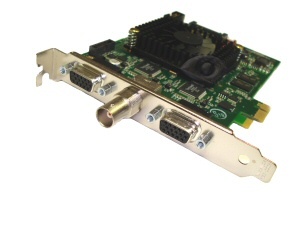 Most DVR systems on the market use an embedded standalone style DVR. These systems cannot be expanded or upgraded in the future when new technology hits the market. Our AVM system however, is based on a platform that can be easily expanded as well as upgraded to encompass new technologies as they are created. 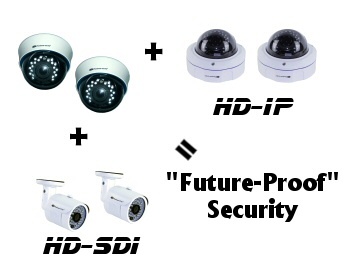 Even AVM systems from 10 years ago can still be upgraded now to allow HD IP cameras, HD-SDI cameras, as well as whatever technology hits the security market next. This makes your camera system "Future-Proof", buy it for your needs today, and expand it for your growing needs tomorrow. With hacking on the rise these days, many customers are concerned about who can see their video, and rightly so. 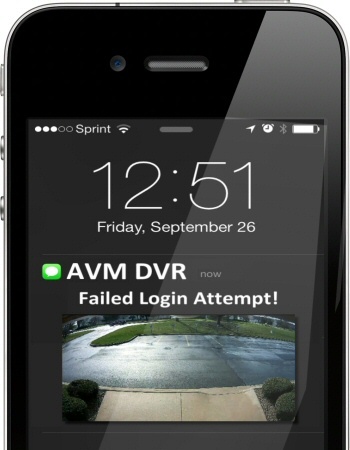 This system has configurable alerts so you can get an email or text message every time someone logs in to view your cameras, or even tries and fails. These are just a few of the alerts that can be configured in the AVM system to keep you informed. This system is also fully compatible with securie encrypted VPN networks for increased security. 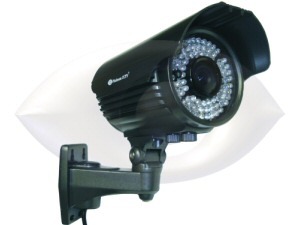 This system includes Infrared Night Vision cameras, allowing you to see what happens around your home or business even if it is completely dark, with no lighting. 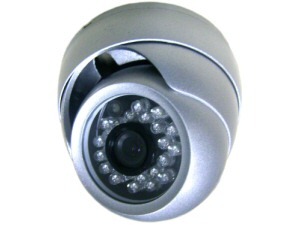 These cameras start with a Low-Light SONY CCD image sensor, then we add Infrared LEDs which shine an invisible light out in front of the camera that only the camera can see. The result: ability to see even in pitch black conditions. Truly integrate your home or business with email motion and text alerts, so your camera system can let you know when you need to watch. Our AVM system can additionally be upgraded with alarm integration for positive alerts when alarms are triggered, now you know when you get an alert that something important is happening. Our newest Analytics cameras can also be integrated to determine the difference between a person, animal or vehicle. 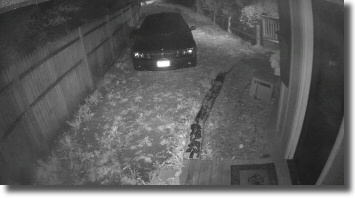 This adds a new untouchable layer of alerts, even for outside cameras. Know when a person is approching your building, even before they get inside! Take your business integration to the next level, with POS system reporting, right on your cameras. Search for video based on transactions, amounts or even specific items. With this level of integration, your camera system becomes a full business management system. Use video for training purposes and much, much more. POS Integration Module available separately. At the core of our AVM software, is our enhanced scheduling center. It provides the ability to schedule complex alerts based on camera motion, signal loss, alarm inputs, analytics alerts, system events and much more. Layer multiple events simultaneously to ensure when you get an alert it is video you want to see. 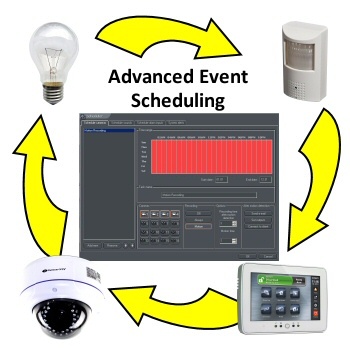 Even use the scheduler to control lights and other devices based on any event. This makes it a powerful automated business or home controller.